I’ve finally dreamed up a solution to the perplexing problem of how to prevent voles, commonly called meadow mice, from eating sweet potatoes growing in your garden. I still remember the desperation of two Columbia Gardeners who approached me after my Master Gardener presentation on “How to Grow Great Tomatoes.” They were thinking sweet potatoes, not tomatoes. Voles were tunneling into their sweet potato beds and eating the growing sweets, “leaving just shells” for the gardeners. I’ve never grown sweet potatoes but ventured two suggestions—peanut-butter baited snap traps or a physical barrier—some sort of wire, perhaps. Since then Erica Smith has posted a blog showing how Master Gardeners dig a trench and install hardware cloth at the Montgomery County demonstration garden to keep voles out of the sweet potato patch there. And this week I’ve thought of another possibility—one that eliminates all the hassle and work of buying and installing a hardware cloth barrier. 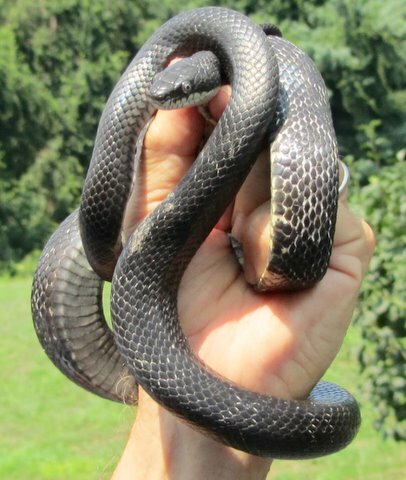 I am going to start a business where I’ll rent out trained black rat snakes, commonly called blacksnakes, to live in sweet potato patches and eat trespassing voles. I got this brilliant idea on Monday, when I returned from buying a new battery for my pickup truck. Ellen the Quilter, busy at work on two gift quilts for young daughters of a friend, greeted me with her finest “you’ll never guess” look. No, that answer would have been too simple. To make a long story blog-length, Ellen had discovered a 30-inch black rat snake in the corner, “behind the broom,” of the small, 6×6 room. “Did you catch it and let it loose in the woods?” I asked, hoping to indicate my faith that she was quite capable of doing so. You need to know that our son, Brian, during his teen years raised a “pet” boa constrictor from cute babyhood to about six feet—a boa, by the way, that Ellen and our daughter, Lynn, from time to time discovered exploring our downstairs living area when it escaped its cage. About 55 years ago, I had earned an “A” in a college herpetology class by catching a copperhead in the mountains near Headwaters, Virginia. And from time to time I still don’t mind doing such honors, especially when the snake is a blacksnake, a common non-venomous constrictor here in the East that preys on mice, rats, chipmunks, birds and their eggs, and voles. Did you note that last word—“voles”? Well, I used a Cape Cod weeder as a “snake stick” (L-shaped, with short lateral bar to press on snake’s neck just behind head) to catch the intruder. I must admit, the blacksnake wasn’t in a particularly happy mood. It retreated behind wires and storage bins in the small room. When I cornered it, it coiled and hissed and struck at the weeder. Later I released the small constrictor into a brush pile on the edge of our woods, the preferred habitat of blacksnakes, often known as “friends of farmers” because of the toll they take on rats and mice. Because blacksnakes are good climbers—remember they eat birds and their eggs—they probably are the most frequent snake visitors to homes in this part of the world. They don’t mind climbing a step or two that would discourage other species. I suspect the blacksnake I caught wandered into our utility room while hunting for a white-footed mouse or a vole in our blackberry patch, which is just outside the door. How it got through a sliding screen and glass doors is a mystery, but in summertime they’re not closed 100% of the time. But back to voles and sweet potatoes. Since blacksnakes love to dine on voles, I’m thinking of training a few as “Bob’s Sustainable Sweet Potato Protectors” and then renting them out to gardeners who want more than “shells” when they harvest sweet potatoes. But the brilliance of my idea is beginning to fade already. What if training a snake to guard a garden is as hard as training a cat to bring in the morning paper? Second thought, I’m sticking to recommending hardware cloth for protecting sweet potato crops. If you can train one to catch rabbits, we'll take it at the Montgomery demo garden! I really do like blacksnakes, but not in the house. You deserve a prize. I assume even a young blacksnake could and would eat newborn rabbits, but a blacksnake big enough to eat a full-grown rabbit would have to be a full-grown blacksnake of 6' for so, which I suppose would also thin out the number of volunteers at the demo garden if they chanced upon the snake. And, yes, I like blacksnakes too, especially when I see them near prime vole or mouse habitat. But the utility room is a good place for a broom, pool filters, and a few storage bins, not an unhappy blacksnake. The way I see it, if a blacksnake is in the house – there must be something there it wants to eat. They are welcome guests! We had a few that “sunned” under our rose bushes every morning. When approached, where did they go? They slithered into our siding! I had never seen such a thing. Your Comments are right on, Carmen. (1) I couldn't say everything in the blog–which was one of the longest I've posted–but last winter we snap-trapped multiple white-footed mice in the utility room, so even though I closed off the mice's apparently entry route this spring, the blacksnake still may have sensed a good meal awaiting there. (2) Blacksnakes don't like humans about as much as humans don't like blacksnakes. When they sense humans, they head for the exits or a good nearby hiding place. That's why we don't see them often even though they are plentiful in the mid-Atlantic area. My sister and I found a 5 inch long baby snake in the basement of our family home this past weekend. I'm pretty sure it was a baby black rat snake. Working with Ray Bosmans for many years, my fear of snakes is not as paralyzing as it used to be growing up. My parents would have smashed that baby snake to smithereens. I'm proud to say that Lisa and I captured that spunky little snake and released it where it would have its pick of fat voles. Thanks, Ray! And thanks, Ria & sister, for sparing a young snake that will over time eat and eat and eat voles and other critters that need to be controlled. Bob, your snake wrangling skill has increased your “street cred” with me. I'm glad we didn't destroy our black snake. Sanford discovered evidence that a mouse (or mice) had started making a home in his barbeque grill (we used the smoker more this summer – less standing out in 90 degree weather). So, clearly there is a need for a snake (or two)around here. You've got the right connection, Bettye. Our common garden snakes–garter snakes and blacksnakes–follow their food. No food, no snake. The mechanical room where we found the blacksnake was home to several mice last winter–well, home until we found them living it up. I suspect the blacksnake still was following their scent when Ellen so rudely interrupted the hunt. I hope the blacksnake is finding lots of white-footed mice and voles to eat in and around the brush pile where I released him/her.